Support curriculum and faculty development to enable interdisciplinary and cross-disciplinary education of students, so they can critically assess the ethical, political, and societal implications of new technologies, and design technologies in service of the public good. Develop experiential learning opportunities such as clinics, fellowships, apprenticeships, and internship, with public and private sector partners in the public interest technology space. Find ways to support graduates who pursue careers working in public interest technology, recognizing that financial considerations may make careers in this area unaffordable to many. Create mechanisms for faculty to receive recognition for the research, curriculum development, teaching, and service work needed to build public interest technology as an arena of inquiry. Provide institutional data that will allow us to measure the effectiveness of our interventions in helping to develop the field of public interest technology….(More)”. Aaron Smith at the Pew Research Center: “Algorithms are all around us, utilizing massive stores of data and complex analytics to make decisions with often significant impacts on humans. They recommend books and movies for us to read and watch, surface news stories they think we might find relevant, estimate the likelihood that a tumor is cancerous and predict whether someone might be a criminal or a worthwhile credit risk. But despite the growing presence of algorithms in many aspects of daily life, a Pew Research Center survey of U.S. adults finds that the public is frequently skeptical of these tools when used in various real-life situations. This skepticism spans several dimensions. At a broad level, 58% of Americans feel that computer programs will always reflect some level of human bias – although 40% think these programs can be designed in a way that is bias-free. 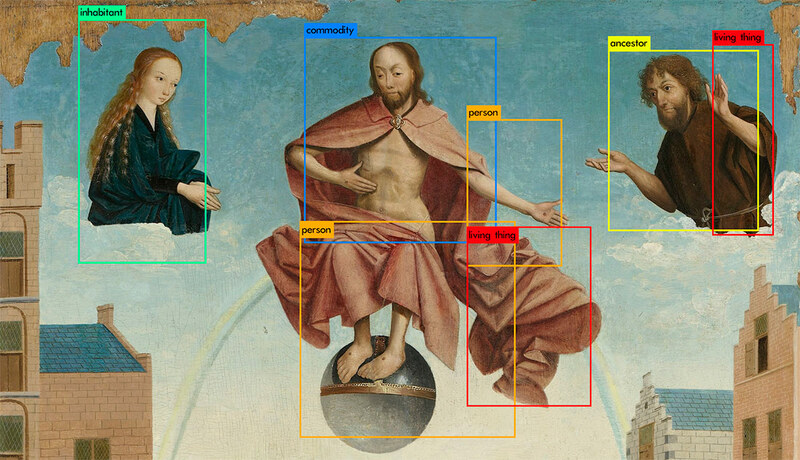 And in various contexts, the public worries that these tools might violate privacy, fail to capture the nuance of complex situations, or simply put the people they are evaluating in an unfair situation. Public perceptions of algorithmic decision-making are also often highly contextual. The survey shows that otherwise similar technologies can be viewed with support or suspicion depending on the circumstances or on the tasks they are assigned to do…. By and large, the public views these examples of algorithmic decision-making as unfair to the people the computer-based systems are evaluating. Most notably, only around one-third of Americans think that the video job interview and personal finance score algorithms would be fair to job applicants and consumers. When asked directly whether they think the use of these algorithms is acceptable, a majority of the public says that they are not acceptable. Two-thirds of Americans (68%) find the personal finance score algorithm unacceptable, and 67% say the computer-aided video job analysis algorithm is unacceptable…. 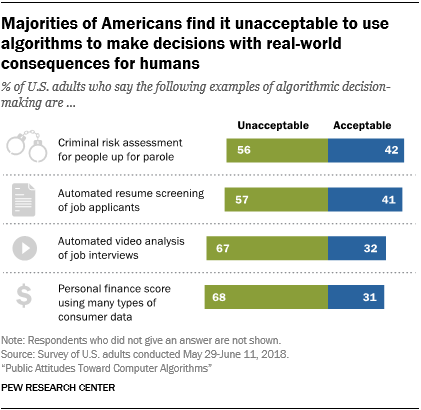 Despite the consistencies in some of these responses, the survey also highlights the ways in which Americans’ attitudes toward algorithmic decision-making can depend heavily on the context of those decisions and the characteristics of the people who might be affected…. In other instances, different types of users offer divergent views about the collection and use of their personal data. 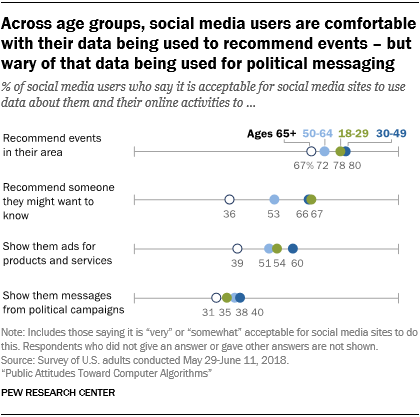 For instance, about two-thirds of social media users younger than 50 find it acceptable for social media platforms to use their personal data to recommend connecting with people they might want to know. But that view is shared by fewer than half of users ages 65 and older….(More)”. Scott Falk, John Cherf and Julie Schulz at the Harvard Business Review: “We recently conducted an in-depth study at Lumere to gain insight into physicians’ perceptions of clinical variation and the factors influencing their choices of drugs and devices. Based on a survey of 276 physicians, our study results show that it’s necessary to consistently and frequently share cost data and clinical evidence with physicians, regardless of whether they’re affiliated with or directly employed by a hospital…. Compare data based on contemporary evidence-based guidelines. Physicians would like to incorporate reliable data into their decision-making when selecting drugs and devices. In our survey, 54% of respondents reported that it was either “extremely important” or “very important” that hospitals use peer-reviewed literature and clinical evidence to support the selection of medical devices. Further, 56% of respondents said it was “extremely important” or “very important” that physicians be involved in using data to develop clinical protocols, guidelines, and best practices…. (More)”.